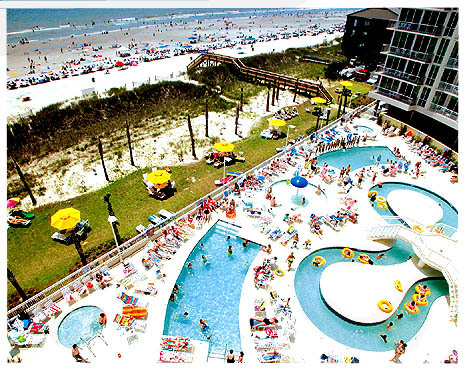 The Avista Resort is one of the newest and most exciting of the North Myrtle Beach high-rise condo hotels. Located a few doors down from Main Street and all the shag clubs, Avista is a popular vacation spot and produces a good rental income. Built in 2005, the Avista Resort is a stunning art-deco inspired resort. Two impressive high-rise towers dramatically arc toward the Atlantic Ocean, and the nighttime lighting makes you feel like coming into Disneyland. 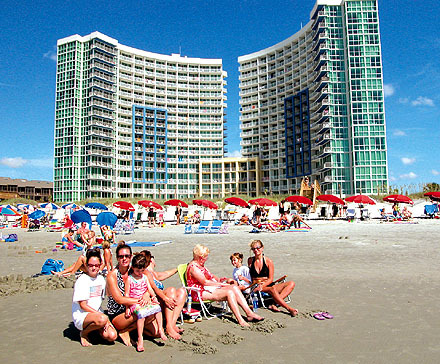 The Avista's North Myrtle Beach family friendly accommodations include numerous swimming pools, hot tubs, a lazy river, and poolside grill area, Families will enjoy being able to walk to several great restaurants, ice cream shops, arcades, and the new pavilion-style amusement park with ferris wheel and other rides. High-speed internet is provided along with access to the on-site convention center, restaurants and a tree-top lounge - ensuring adult guests are able to relax in a sophisticated and resort-style environment as well. Varied Floor Plans and Options make Avista the smart choice for virtually anyone. With modern appliances, tiled-entry, central and full kitchens, owners and guests will love the luxury of the fully furnished condominiums. The resort boasts beautiful ocean views from nearly all rooms because of the unique “fan-out” architecture of the towers, maximizing spectacular Atlantic Ocean views from the wrap-around balconies of the resort. More good points include a state-of-the art work-out facility, and on-site covered parking. Room types available at Avista Resort include spacious studios along with one, two and three bedroom units. Square footage runs from 550-1,600 sq ft. This is an excellent resort to choose if you like the Baby Boomer-oriented North Myrtle Beach area! AVISTA OCEAN RESORT PHASE 1 Bldg. Avista Ocean Resort Phase II Bldg.